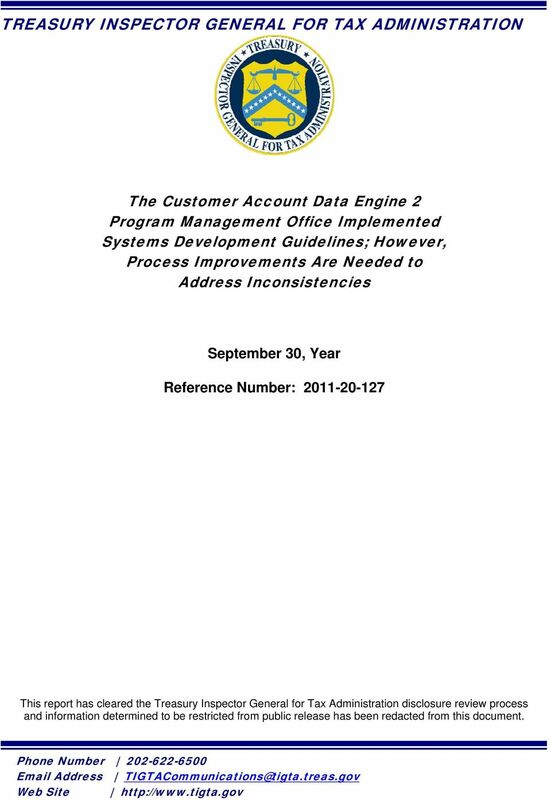 Download "TREASURY INSPECTOR GENERAL FOR TAX ADMINISTRATION"
2 HIGHLIGHTS THE CUSTOMER ACCOUNT DATA ENGINE 2 PROGRAM MANAGEMENT OFFICE IMPLEMENTED SYSTEMS DEVELOPMENT GUIDELINES; HOWEVER, PROCESS IMPROVEMENTS ARE NEEDED TO ADDRESS INCONSISTENCIES Highlights Final Report issued on September 30, 2011 Highlights of Reference Number: to the Internal Revenue Service Chief Technology Officer. 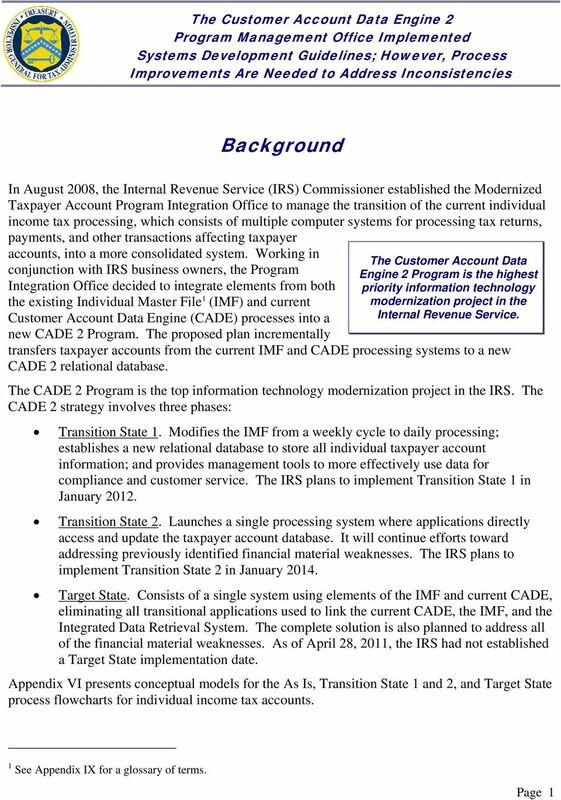 IMPACT ON TAXPAYERS The mission of the Customer Account Data Engine (CADE) 2 Program is to provide state-of-the-art individual taxpayer account processing and technologies to improve service to taxpayers and enhance Internal Revenue Service (IRS) tax administration. 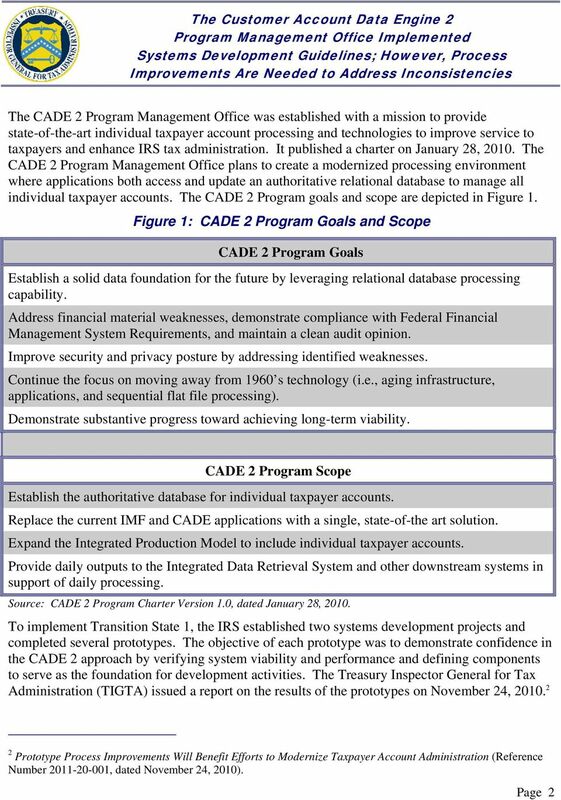 Once completed, the new modernization environment should allow the IRS to more effectively and efficiently update taxpayer accounts, support account settlement and maintenance, and process refunds on a daily basis, all of which will contribute to improved taxpayer services. 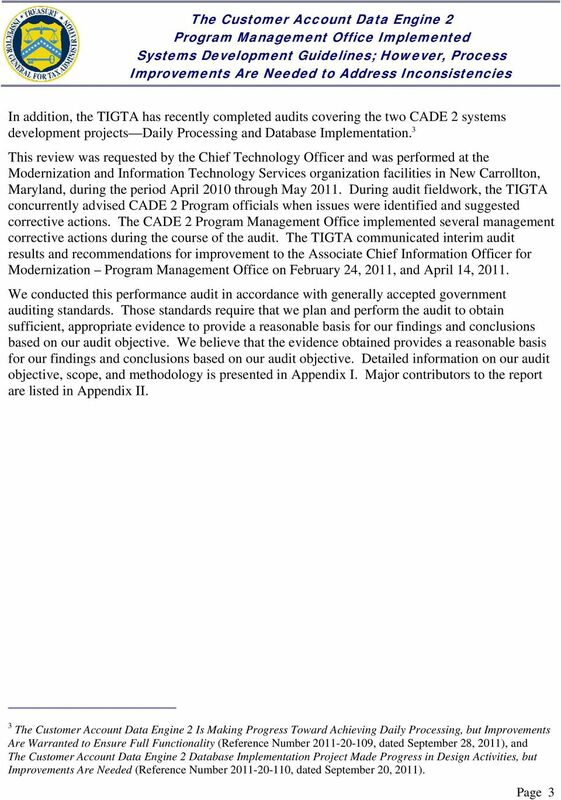 WHY TIGTA DID THE AUDIT The overall objective of this review was to determine if the CADE 2 Program Management Office planned and provided oversight for Transition State 1 design activities in accordance with systems development guidelines, including applicable security provisions. 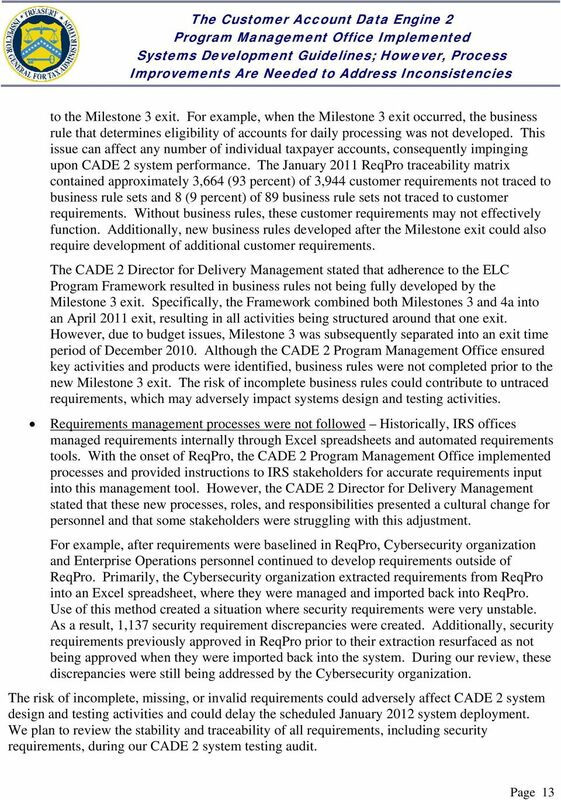 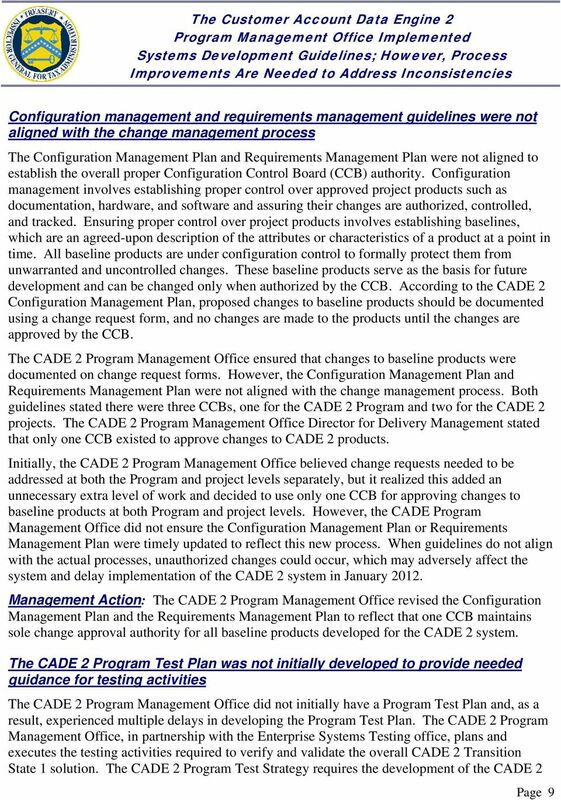 WHAT TIGTA FOUND The CADE 2 Program Management Office implemented guidelines to cover key systems development processes. 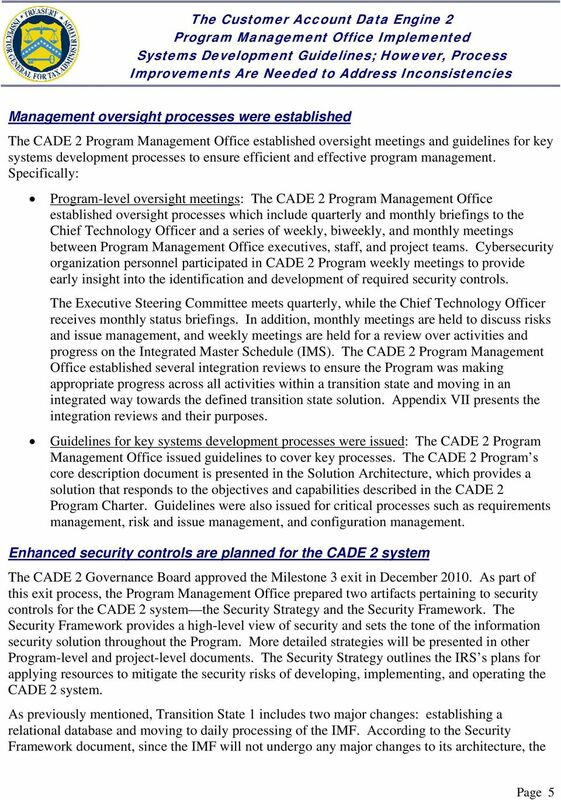 Due to the critical nature of the system to the IRS mission, 18 enhanced security controls above those required by security guidelines were added to the CADE 2 system to help protect data from unauthorized access, modification, and corruption. 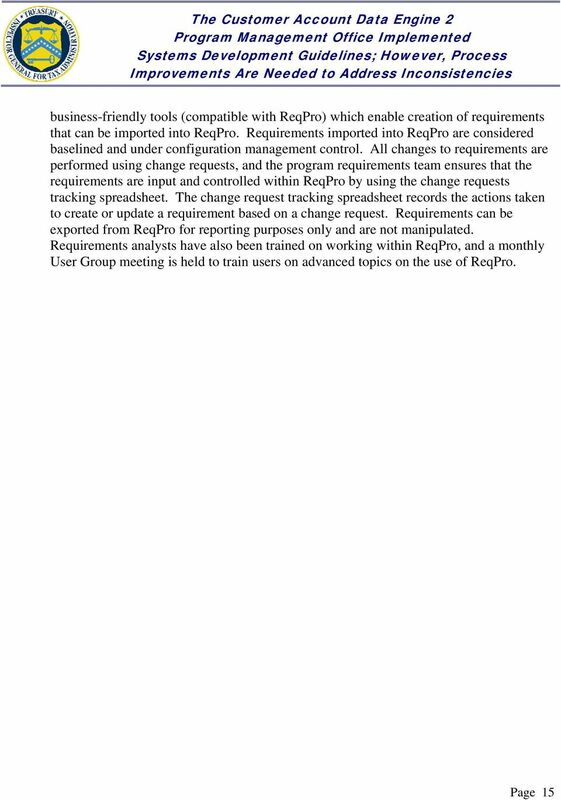 Improvements are still needed to ensure Program consistency. 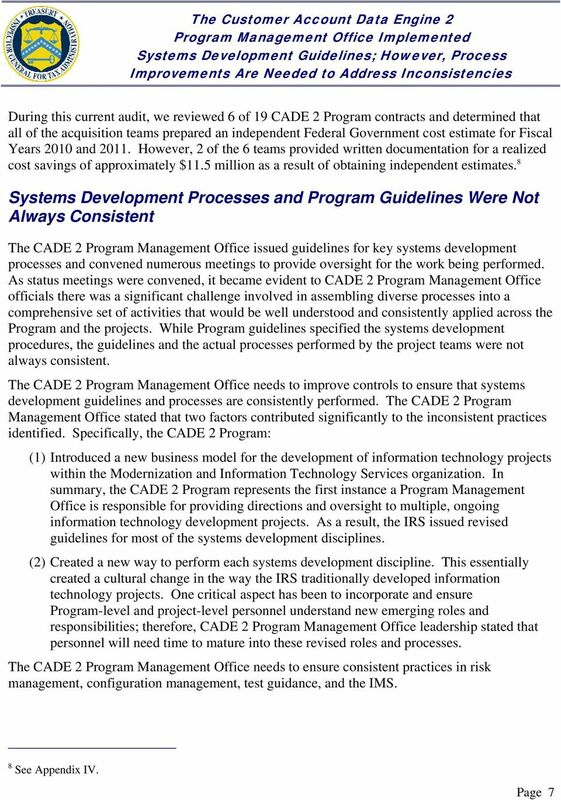 Specifically: 1) systems development guidelines and related processes were not consistently implemented by CADE 2 personnel, and 2) requirements and business rules were not sufficiently developed and traced to their sources before the CADE 2 exit of design activities. 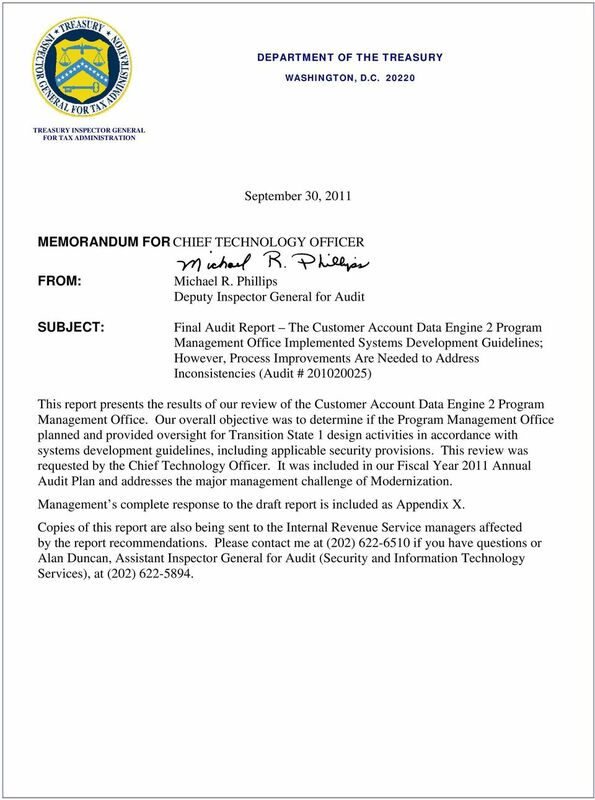 The IRS implemented corrective actions; however, some were not developed or completed prior to the conclusion of our audit. 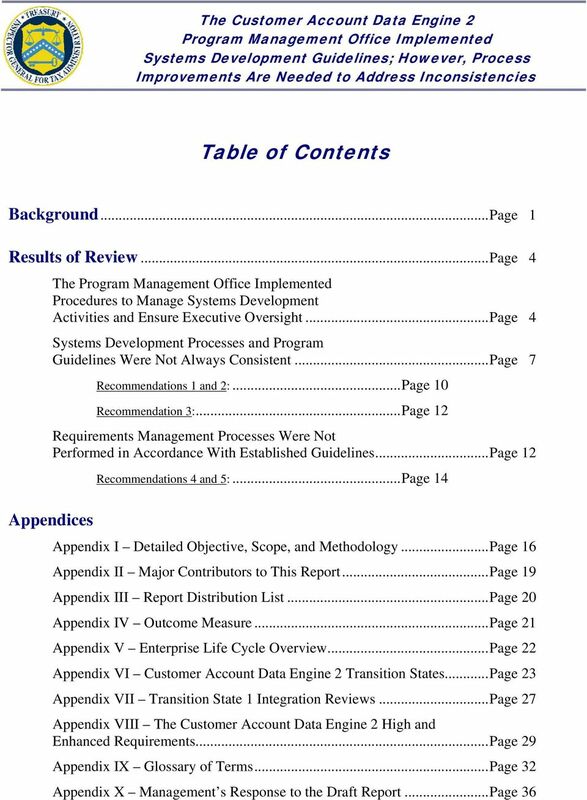 WHAT TIGTA RECOMMENDED TIGTA recommended that the Chief Technology Officer ensure project test plans are developed timely; the Internal Revenue Manual and other guidelines are revised to include Program-level test plans; and a comprehensive Integrated Master Schedule is developed. 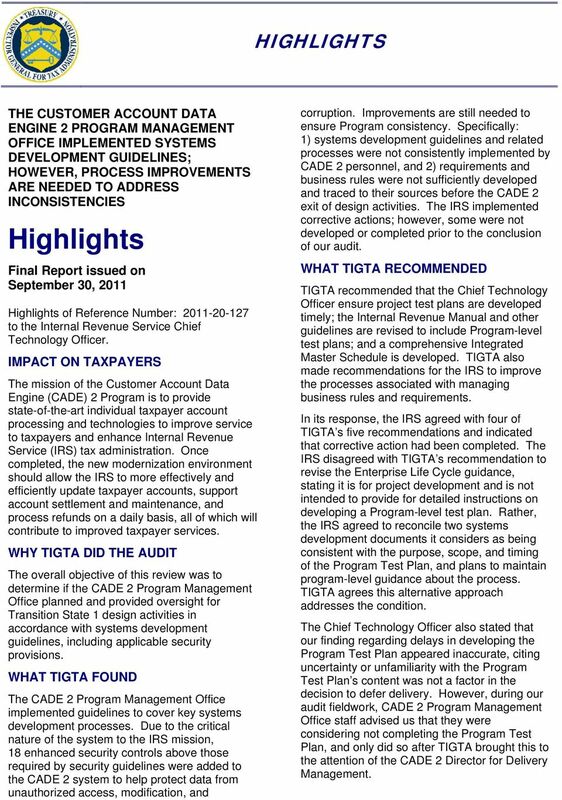 TIGTA also made recommendations for the IRS to improve the processes associated with managing business rules and requirements. 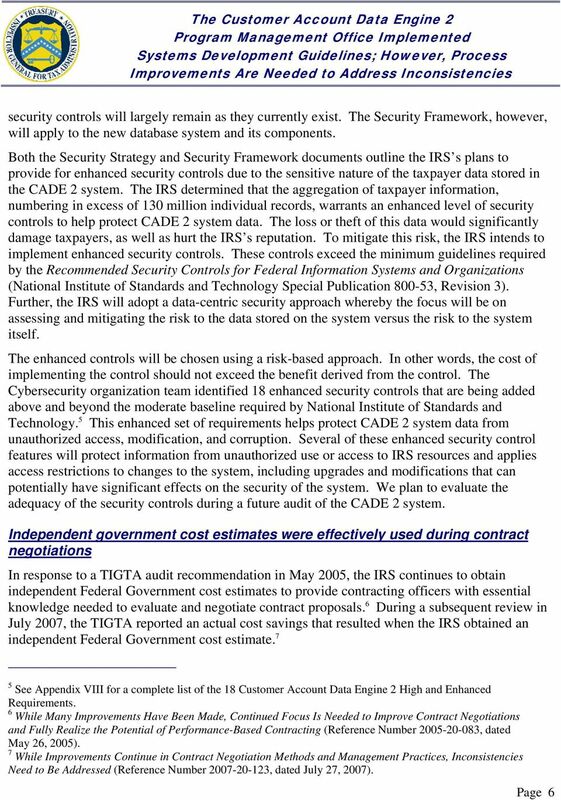 In its response, the IRS agreed with four of TIGTA s five recommendations and indicated that corrective action had been completed. 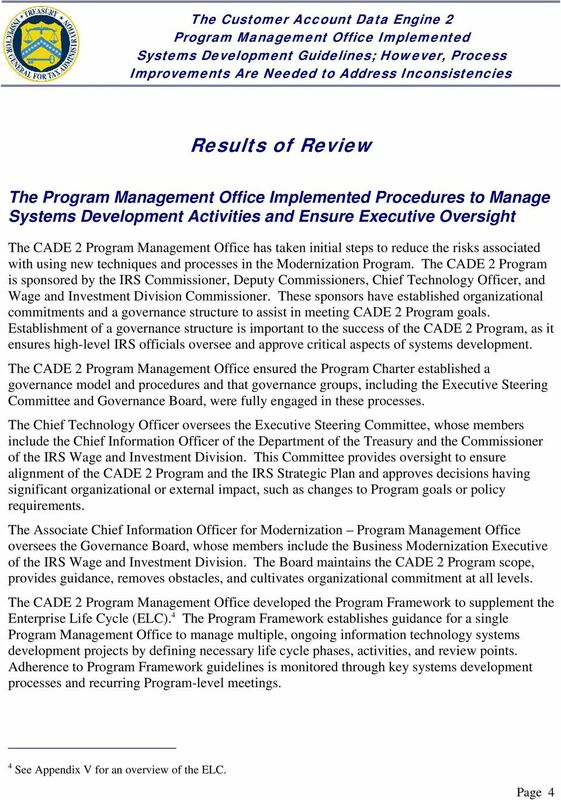 The IRS disagreed with TIGTA s recommendation to revise the Enterprise Life Cycle guidance, stating it is for project development and is not intended to provide for detailed instructions on developing a Program-level test plan. 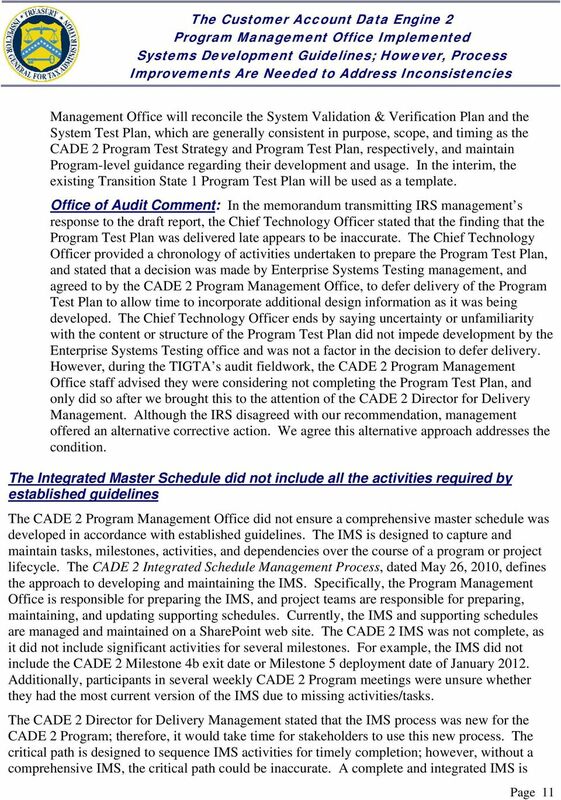 Rather, the IRS agreed to reconcile two systems development documents it considers as being consistent with the purpose, scope, and timing of the Program Test Plan, and plans to maintain program-level guidance about the process. 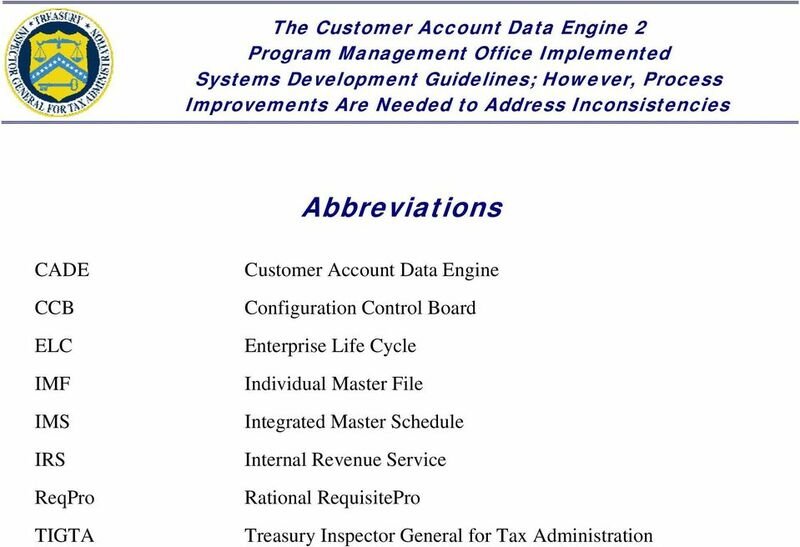 TIGTA agrees this alternative approach addresses the condition. 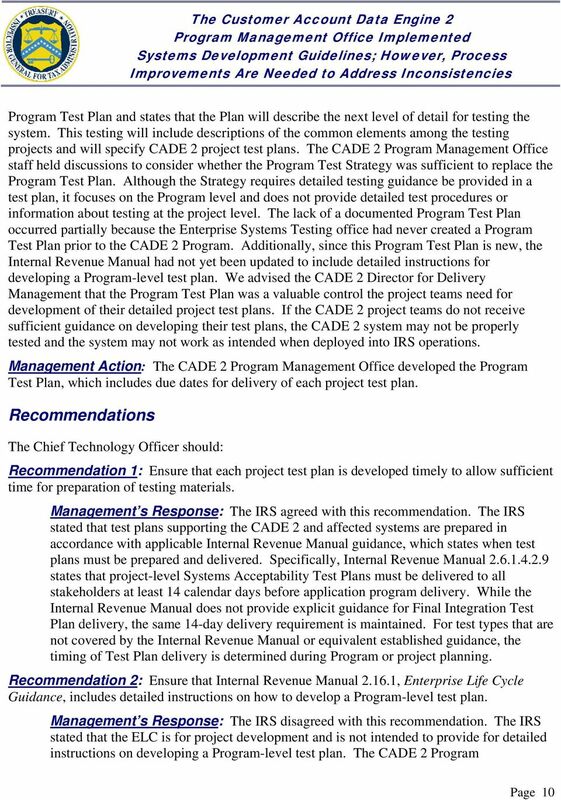 The Chief Technology Officer also stated that our finding regarding delays in developing the Program Test Plan appeared inaccurate, citing uncertainty or unfamiliarity with the Program Test Plan s content was not a factor in the decision to defer delivery. 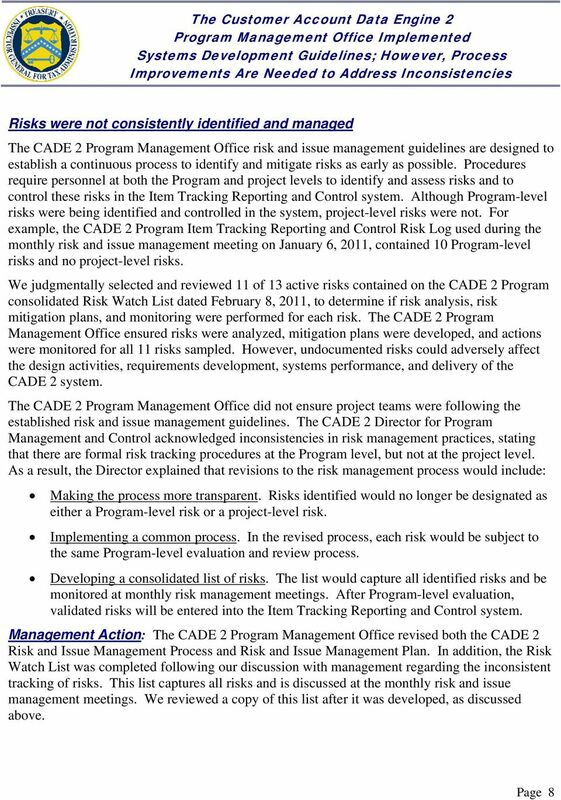 However, during our audit fieldwork, CADE 2 Program Management Office staff advised us that they were considering not completing the Program Test Plan, and only did so after TIGTA brought this to the attention of the CADE 2 Director for Delivery Management. 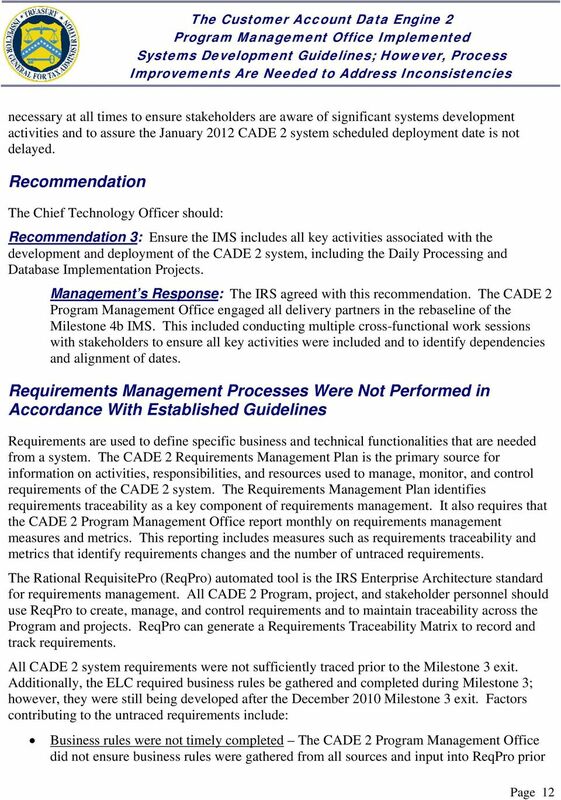 Reviews to Determine Architectural Compliance of Information Technology Acquisitions Need to Be Consistently Performed and Documented. 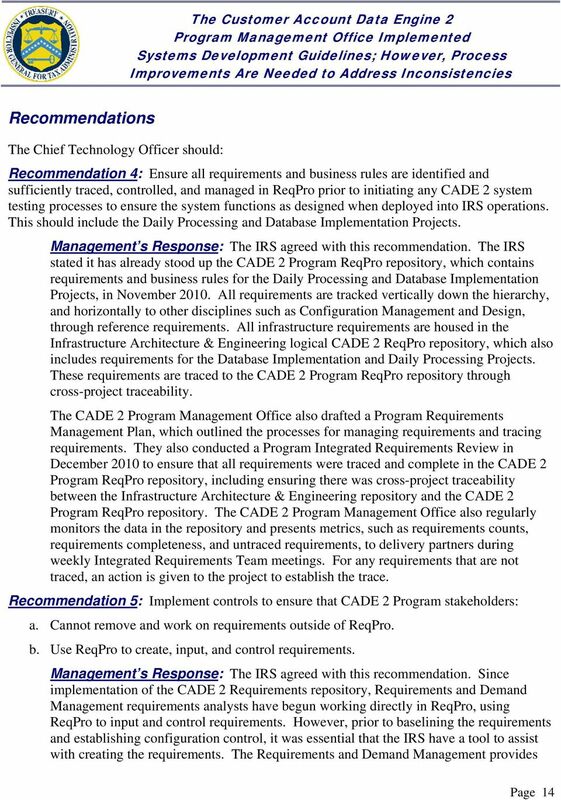 Computer Security Roles and Responsibilities and Training Should Remain Part of the Computer Security Material Weakness.